are a beginner & unsure about joining a class straight away. 1-1 tuition is a good way to start. are returning to yoga and wish to re-build strength & confidence. Last year, I fell off a ladder and nearly put myself in a wheelchair. Although I didn’t break anything the resulting stiffness and pain could not be treated by Physio, osteopath or chiropractor. However one-to-one sessions of yoga with Angela has had extraordinary benefits and improved my range of movement and core strength to levels I have not had before. I now sleep better, have more energy and can enjoy playing sports again. The relaxation element of the yoga practice I have also found greatly beneficial in restoring calm in my day. Its great to have found such a positive way to de-stress! Angela has been great at tailoring private sessions that meet my needs & take into account specific health issues. She also doesn't make me chant! I find having a private lesson is relaxing and being able to tailor to ones needs is a huge benefit. I can recommend this method. ~I have been to many yoga classes, but always felt that I would like more support to improve my practice. 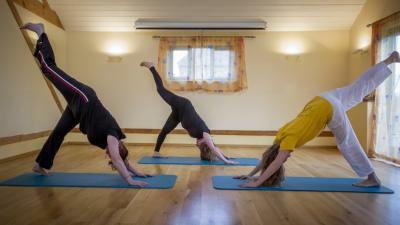 I have had a few private yoga classes with Angela and have really enjoyed them. Angela is an amazing teacher and extremely knowledgeable. I am experiencing a more holistic approach to yoga and can already feel the benefits. It’s good fun too!